This past weekend, we hosted a friendsgiving potluck. I wanted to contribute a roast, but didn't want to just do a turkey or ham. I settled on a brisket, something I have made with mixed results in the past. A while ago I got an immersion circulator and have heard many success stories about cooking the brisket with this method. I'm a big fan of an oven braised brisket, I somewhat like that the slices hold somewhat firmly together, but the meat itself is tender. I was afraid that cooking sous-vide would make the brisket maybe TOO tender (if there is even such a thing). I also heard that the juices that come out of the bag are not very flavorful and usually just tossed. This was something that made me almost not cook it this way, I didn't want to miss out on pan juices. However, in the spirit of branching out and trying something different I went for it and decided to try my luck on a sauce. 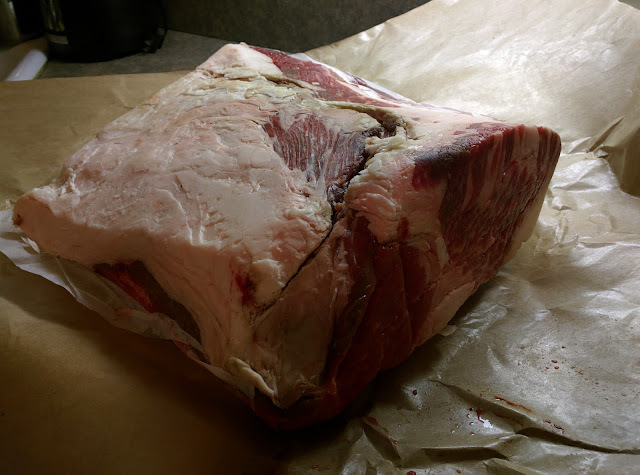 I trimmed off a good deal of fat from the brisket. Some said I maybe took too much off, but I figured given the sous-vide, the meat will still properly cook and be tender. I then toasted my flavors: pink peppercorns, cumin seed, coriander seed, Mexican oregano, bay leaves, ancho, pasilla, garlic. 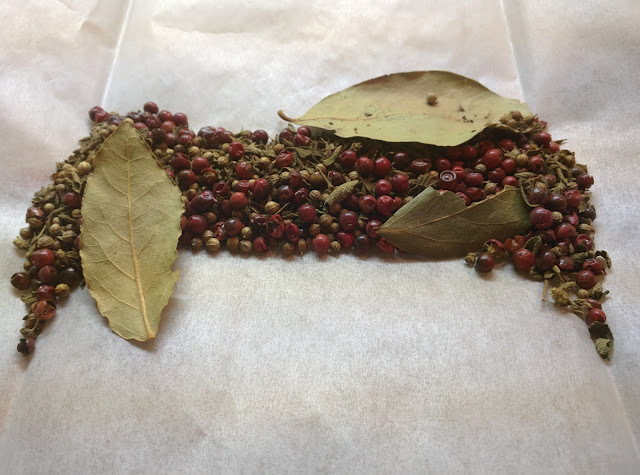 I put all of these ingredients into a spice grinder (with the garlic) and had a very loose paste to rub all over the brisket. 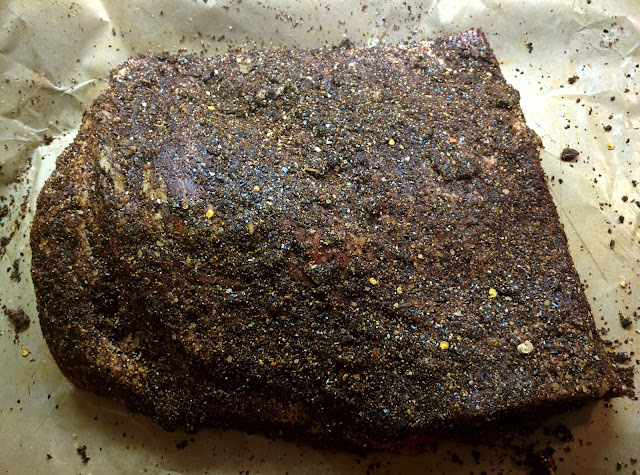 I loved the color of the spice rub on the brisket, it was a deep dark red color. After this, I did a pre sear on both sides. The spices burned a little, so I wonder if the rub should've gone on after searing, something to experiment with. After vacuum sealing, it was time for the brisket to go for a bath. I cooked it at 134F for about 45 hours. Recommendations varied from 130-140 for 48 hours, so I went somewhere in between on the temperature. The 45 hours was a result of starting it a little late, but I didn't think it would have much of an impact at that point. The brisket came out as one solid piece. 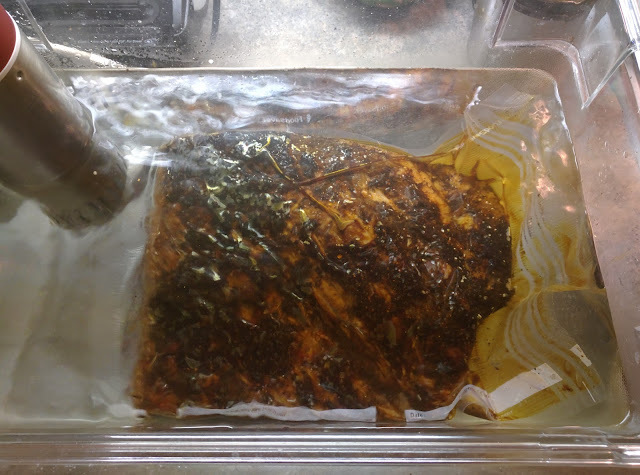 I've heard that it can sometimes fall apart when it comes out of the bag, I was able to place it in a super hot oven for a few minutes just to get some sort of color on the outside without cooking it any further on the inside. I was able to cute nice slices out of the brisket, and the texture was wonderfully tender. The spice rub colored the outside nicely as well and the earthy toasty flavors really came through. I was also lucky enough to get a flavorful and meaty bag juices. I reduced them in a pan and added pads of butter while off the heat to finish. This was spooned over the slices. 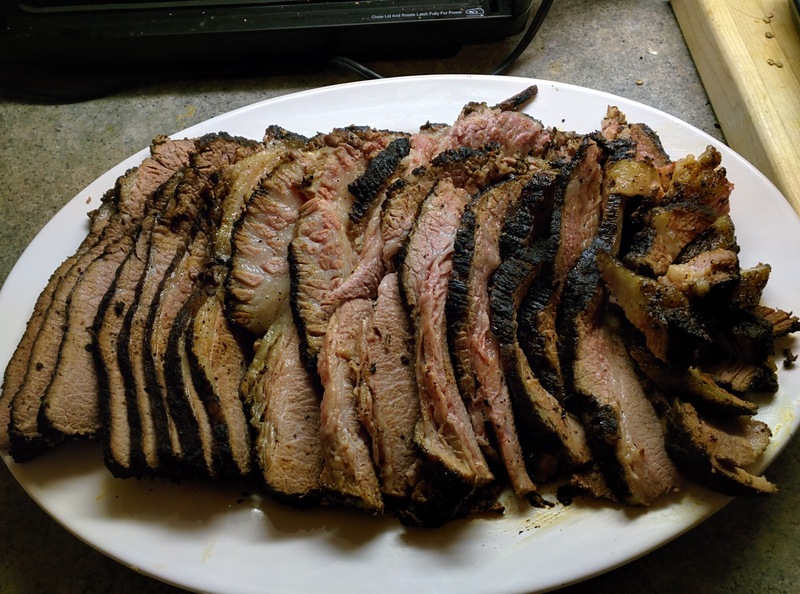 I am happy to say that all 9 pounds of brisket were happily devoured by our guests. This is definitely going to be something I'll be making more often, it might even be a new holiday tradition.